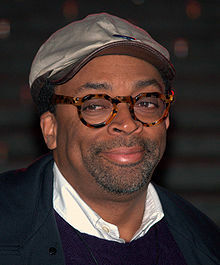 Spike Lee (born March 20, 1957) is an American movie director, producer, screenwriter, and actor. He also teaches movie at New York University and Columbia University. Lee has acted in many of his own movies. Lee was born Shelton Jackson Lee in 1957 in Atlanta, Georgia. His mother was a teacher, and his father was a jazz musician. When Lee was very young, the family moved to live in Brooklyn, New York City. His mother gave him the nickname "Spike". The first movie Lee directed was She's Gotta Have It. Lee directed the two music videos for Michael Jackson's single "They Don't Care About Us". In 2002 Lee won the Special Award at the BAFTAs. This page was last changed on 18 April 2016, at 08:46.